Your front door has several functions. The primary one is to protect you and your family from unwanted guests. The second one is to upgrade the overall curb appeal of your home and bring that wow factor to your exterior design, giving you a chance to express your personality and decorating skills. 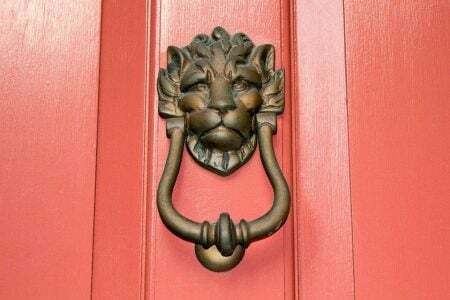 If you think your front door needs a little boost, and want to go beyond a door knocker, try out some of the following decorating ideas. 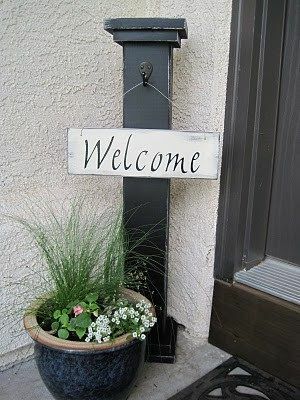 If you are tired of traditional décor, you should consider putting up a chalkboard sign on your door. 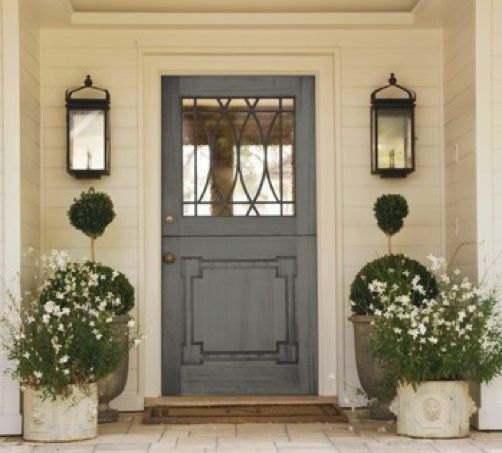 A black board and a simple frame will contrast your door nicely. Additionally, chalkboard paint is a perfect addition if you want to write your welcome messages yourself, put inspiring quotes on display, write funny jokes, or simply use it for creative monograms or your house number. Also, you can change the writing as frequently as you wish, depending on the season and your mood. 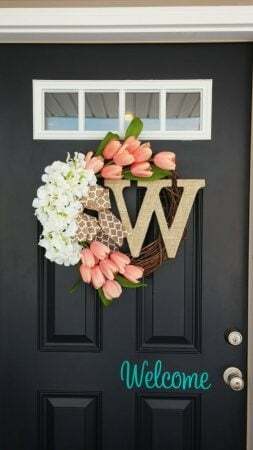 During the last few years, big letter monograms on the front door have been a big trend. Everybody loves the way they look and they can drastically change the style of your front door. You can easily find over-sized letters at local craft stores, but you can easily make your own monograms as well. To make things more interesting, cover the letters with some nice fabrics, twine, moss, sea glass, shells or simply paint them in bright colors. No matter what you choose to do, you will manage to pay homage to your family name in the most fun and creative way. 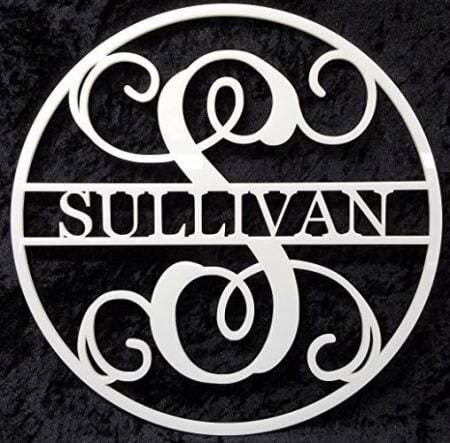 Click on the image below to see a range of monograms, names and initials you can buy. You probably have some empty frames in your basement. 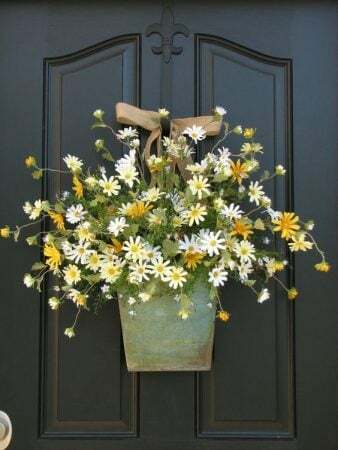 Don’t throw them away, but use them to decorate your front door. This is an easy project, versatile and highly economical. 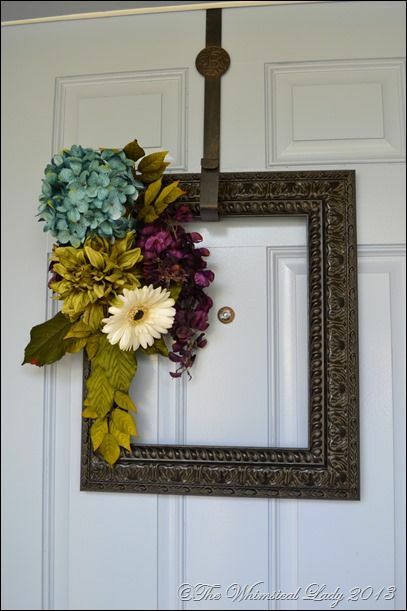 Use your creativity to embellish the frames with anything you find around the house; from scrapbook paper to faux flowers and fabrics. You can make things more fun and occasionally add interesting postcards or your favorite memories from your vacations and make your front door truly unique. This decoration is perfect for spring and summer. You can pick the prettiest flowers from your garden and make them a part of your exterior design. Pick a small basket and fill it with colorful roses, leaves and branches thus creating a beautiful refreshing decoration for your entrance. What is more, you can even make this ornament during the colder weather, but you should use faux flowers. 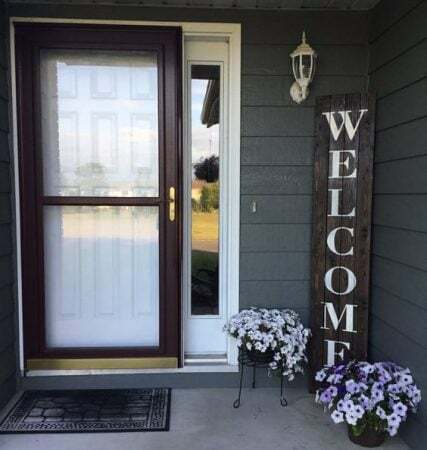 This way, your doors will look beautiful throughout the year. This is the most traditional decorative piece you can find for your front door and it always looks mesmerizing. You can buy a wreath you like or make your own. Just tie together some pine tree branches, decorate with flowers, bows and leaves and voila! For the holidays, you can always add some Christmas ornaments, pine cones and a few lights and you are ready to celebrate. 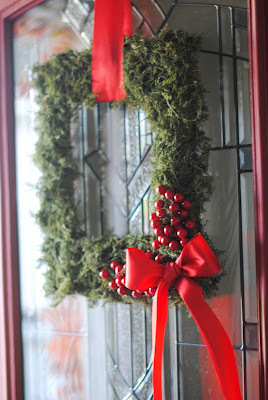 Furthermore, you can add other pieces that symbolize other holidays and make your door special for every holiday season. 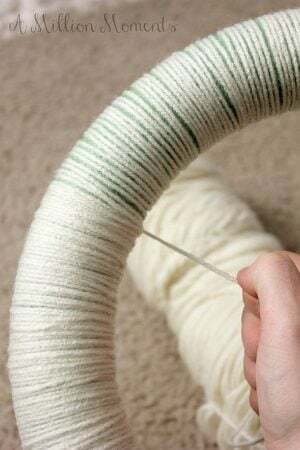 If you have a hobby, such as knitting, you should pay tribute to it. 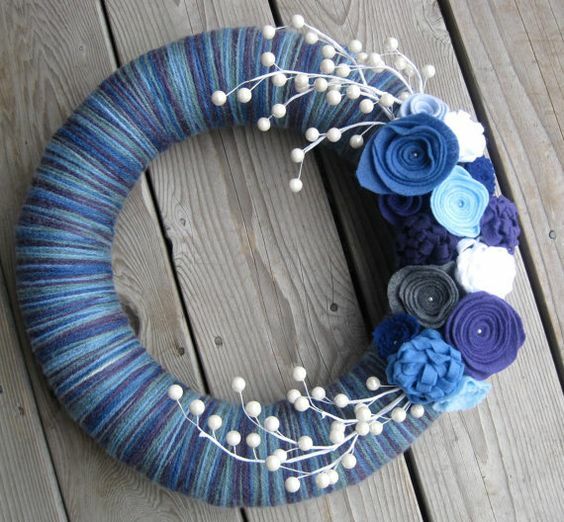 Create the most unique and mesmerizing wreath for your door by gluing or tying several balls of yarn together. Click image below for a tutorial from Million Moments. This one-of-a-kind decoration will tell everyone about your hobby and you will feel good about displaying such beauty on your door. For traditional decor you can stick to neutral colors of your preference, but you can elevate the look and use Christmas colors for the merry holidays. 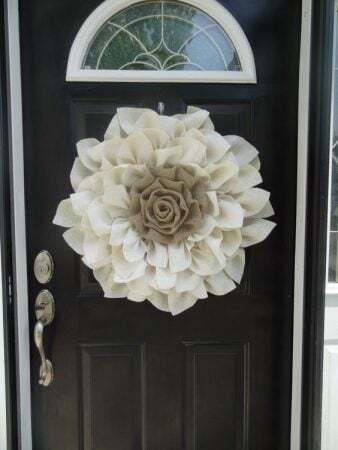 You don’t necessarily have to put up the decoration on the door itself. You can put it right in front of it or beside it. Illuminate the walkway with soothing candlelight and create a romantic entrance to your home. Arrange a few flowers and pine tree branches around the candles to tie the look together. Just make sure to watch your step. If you are more into the minimalist look, you should try to create some simple circles or squares on your front door. 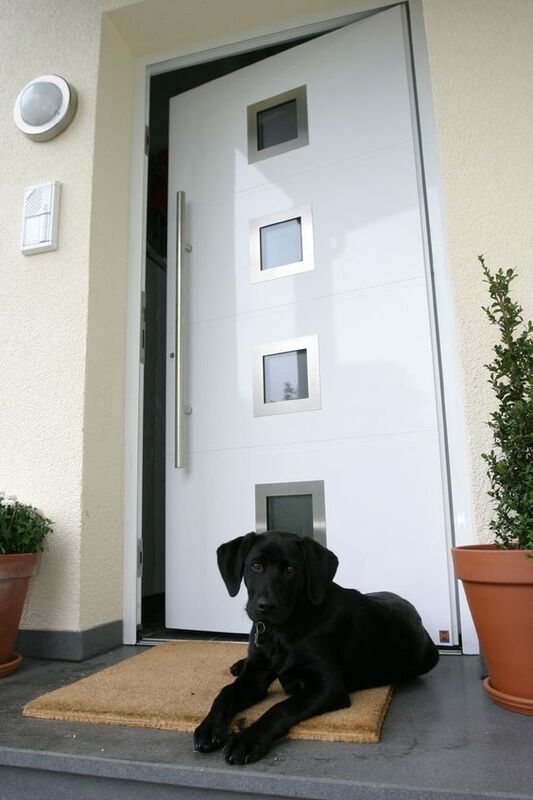 This decor will work best on aluminum security doors since they look sleek and simple. 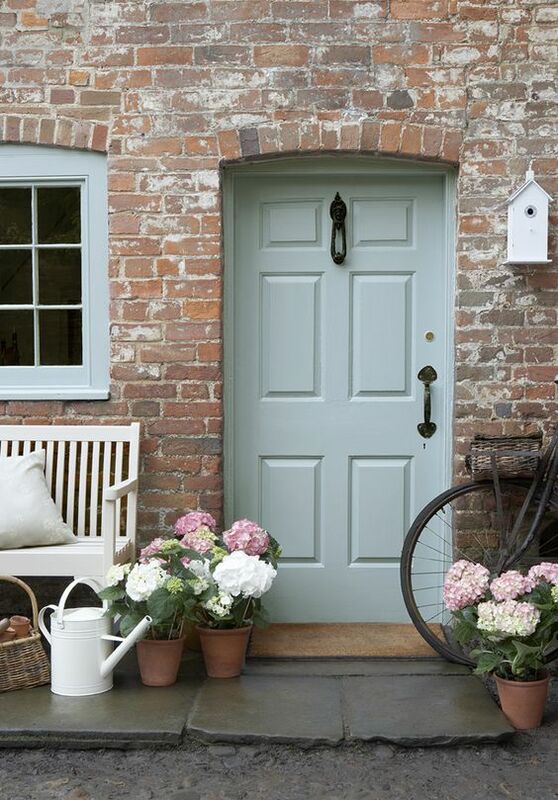 All you have to do is repaint your door in a neutral, pastel color and create a few vertical circles in the middle. 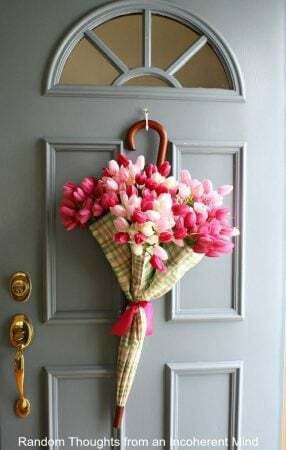 Additionally, you can make those circles out of glass and add them to your front door for a simple but elegant upgrade. 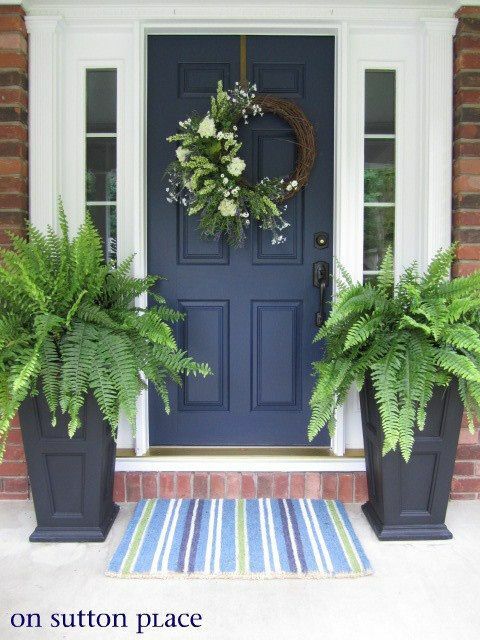 For this look you will need a bit more accessories because you won’t be decorating only your front door. 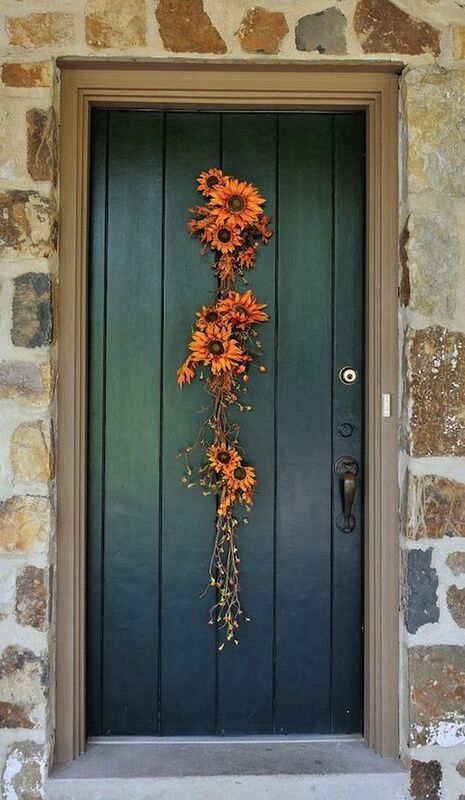 Hang a wreath or some other piece you like on the door, but add some color and creativity to the porch as well. 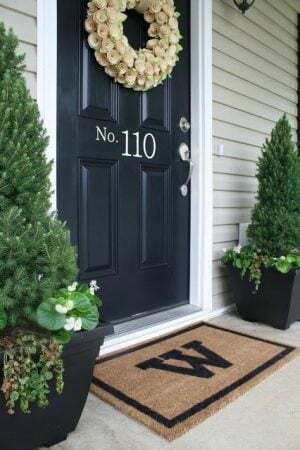 Use the colors you used for the door piece and incorporate them through cushions for the bench, door mat and other details on the porch and walkway. Also, wrap garlands or soft lights around the supporting pillars and add a few potted plants beside the door to create a homey, rustic feel. For the minimalist look, you should turn to symmetry. Instead of putting up ornaments on the door, focus on what’s on each side of the door. Place two potted plants of the same species, height and shape on each side and make sure they are in identical pots. You can opt for smaller bushes or taller trees – it really depends on what you like better, just make sure they are as symmetrical as possible and that they contrast the color of your doors. As you can see, there are plenty of ways you can decorate your front door. Don’t leave them plain and dull. Instead, add some color, texture and fabrics to it in order to make them beautiful and unique. This is your chance to express yourself and your creativity, use all the things you like and not just put your soul into decorating during the holiday season. 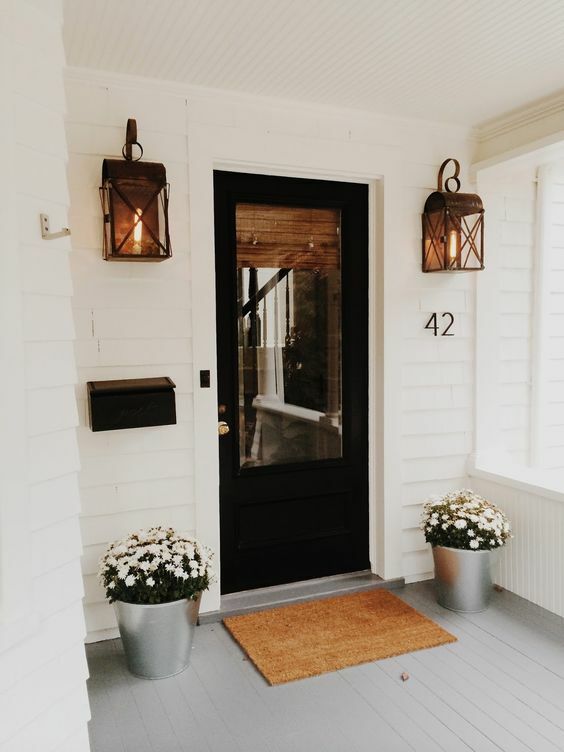 Let your front door exude cozy and homey atmosphere throughout each day.